Learning how to plant a tree for Arbor Day or Earth Day is a fun and educational DIY gardening project for kids. These tree planting and gardening tips are perfect for schools, homeschoolers, and families. A brief history of Arbor Day and Earth Day is included in this Arbor Day tree planting guide. Every year the public is encouraged to plant and care for trees on Arbor Day. 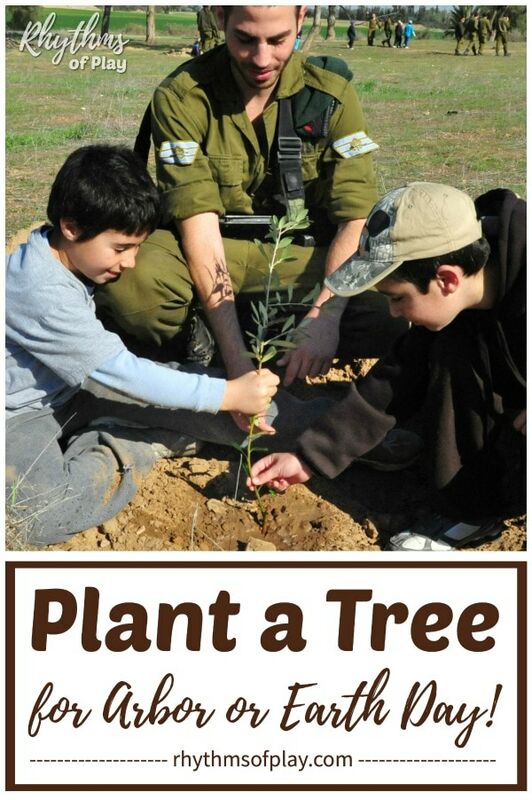 Planting a tree for Earth Day would also be a great day for tree planting! Plant a tree for Arbor or Earth day with this arbor day tree planting guide. Be sure you read through this tutorial, and the tips that follow, to learn how to plant a tree before starting this DIY gardening project. This post is a part of the Get Outside & Connect Series. Click on the link to learn more about it. A brief history of Arbor and Earth day can be found below the tree planting instructions. Plant a small tree sapling as opposed to a larger tree in a large pot. Larger trees take a lot more work to plant. Place the soil on a garden tarp as you dig it out, so that replacing the soil in the hole does not damage the surrounding area. Keep track of what soil was dug out first and what soil was dug out last. Dig a square hole as opposed to a round hole. 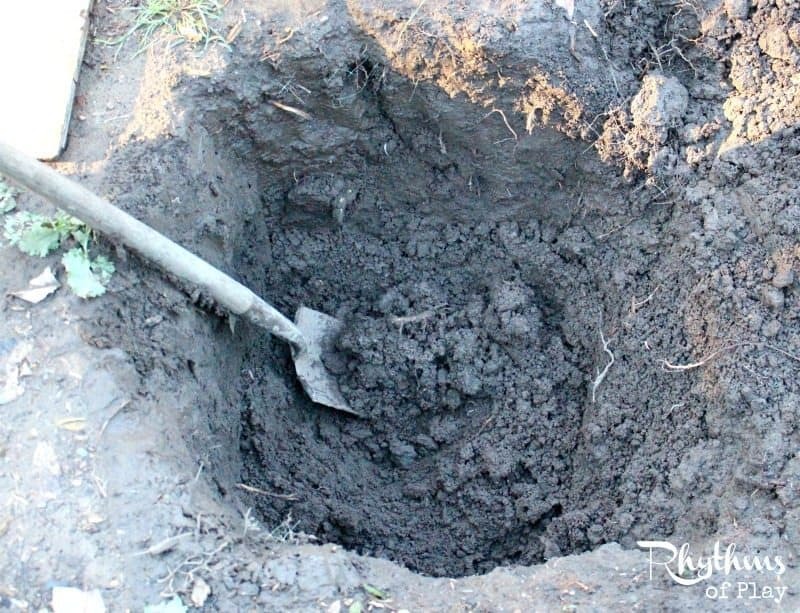 When a tree is planted in a square hole the roots of the tree will grow into the soil around it, while round holes tend to cause the tree roots to circle and become root bound. You want to make sure that the hole is approximately 3 to 4 times wider than the container that it came out of. Use a gopher basket to keep the gophers and other rodents from eating the roots and killing the tree. As the tree grows the wire will gradually rust away, and will not constrain the roots. We made a DIY gopher basket with poultry netting and galvanized wire that you can see in the photo below. Use a hand cultivator to very gently tease out the roots of the tree after you remove it from the pot before you plant it in the ground. Place the tree in the middle of the gopher basket and carefully spread out the roots before covering with dirt to plant it. 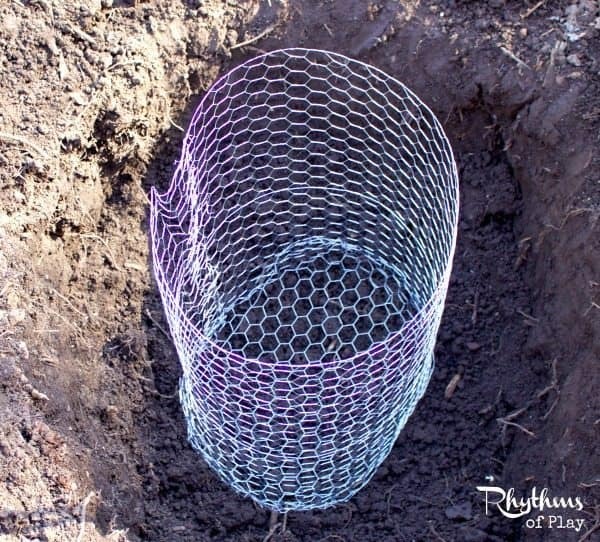 Fill in the hole around the tree sapling and gopher basket with soil in the same order that you dug it out. In other words, replace the dirt first that you dug out last, and replace the dirt you dug out first last. The idea is to keep the topsoil on top and the subsoil on the bottom. Not to worry… this is not an exact science. Do the best you can. You also want to avoid planting the tree too deep in the ground. With your shovel, fill and firmly pack the soil so that there are no air pockets. Make sure the soil level is below the root collar. Water the tree in as you replace and pack the soil in the hole. This will help the soil settle and eliminate air pockets. Trees and plants need to be watered regularly after they are planted. Usually about once every 7 to 10 days is enough for the first growing season. The idea is to keep the soil and mulch around your tree moist but not soggy. After the water has soaked in it is also a good idea to spread mulch around the base of your new tree sapling to provide protection and warmth. We like to use straw that we get from a local farmer for this purpose. 1. If the tree has a graft (many fruit trees do), make sure it rests just above the soil line and does not get covered when planted. Also, make sure that the graft does not face south. You don’t want it getting hit by the hardest sun most of the day. 2. Do not add soil amendments to the hole unless absolutely necessary. The roots of the tree may not want to grow out of the soil you have amended if the surrounding soil is too different. In this case, they become root bound, just as if they were in a pot. 3. Water your tree regularly after you plant it in the ground. The soil and mulch around your tree should be kept moist but not soggy. Around once per week is usually enough for the first growing season. Remember, the tree does not have extensive roots at this time. 4. Clean up your garden tools so they don’t rust and put them away. Tools that are well taken care of will last a lot longer. We are raising a helper so our daughter helps us with everything! Here she is helping grandma plant a young fig tree sapling. My mother has an amazing organic permaculture garden with over 50 varieties of fruit trees and bushes so we are always over at her house helping in the garden. In the US, Julius Sterling Morton began Arbor Day in Nebraska in 1872 to help bring attention to the importance of trees. Arbor day was founded because Julius Morton wanted people to plant trees. He believed that trees were needed to serve as effective windbreaks, and would provide fuel and building materials. More than 1 million trees were planted in Nebraska on that first Arbor Day in the US. Every year since then the public is encouraged to plant and care for trees on Arbor Day, but planting one for Earth Day would make just as much sense. They usually fall within a week of each other in the US. In the United States, Arbor day falls on the last Friday in April. In 1970, Senator Gaylord Nelson from Wisconsin founded Earth Day. He held an environmental teach-in on April 22, 1970, because he was worried about the rate of industrialization and lack of care for the environment. Most people have forgotten about the importance of Arbor day since the advent of Earth Day. May this post serve as a reminder of the importance of planting new trees no matter which holiday you prefer to celebrate! Earth Day is April 22 in the United States. 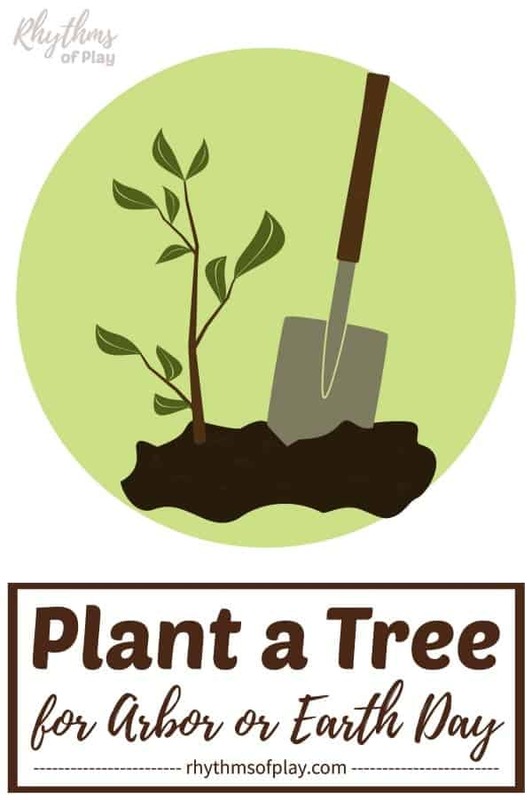 Plant a Tree for Arbor Day or Earth Day! Planting a tree is a fun and educational DIY gardening project for the whole family. 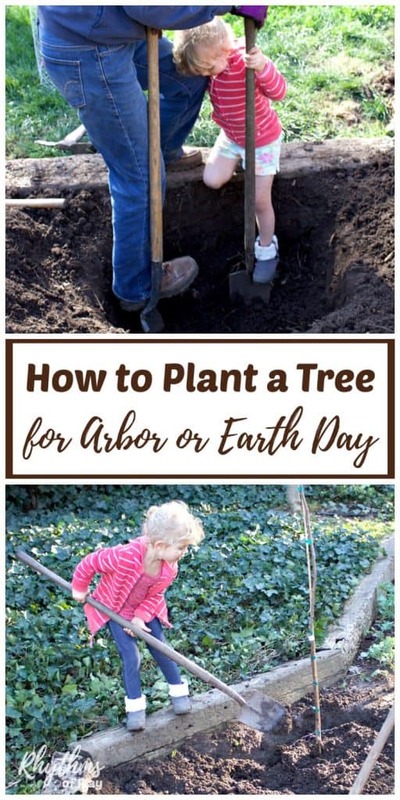 Teach your kids how to plant a tree using these simple tips for Arbor Day or Earth Day this year. Don’t forget to pop over to have a look at our Spring Bucket List for more seasonal arts, crafts, and fun spring activities. Arbor Days are the best! It’s our favorite time of the year! We know it sounds ironic from someone like us but we’re in this business because we are passionate about trees. So excited for our Arbor Day this year! Stay safe!